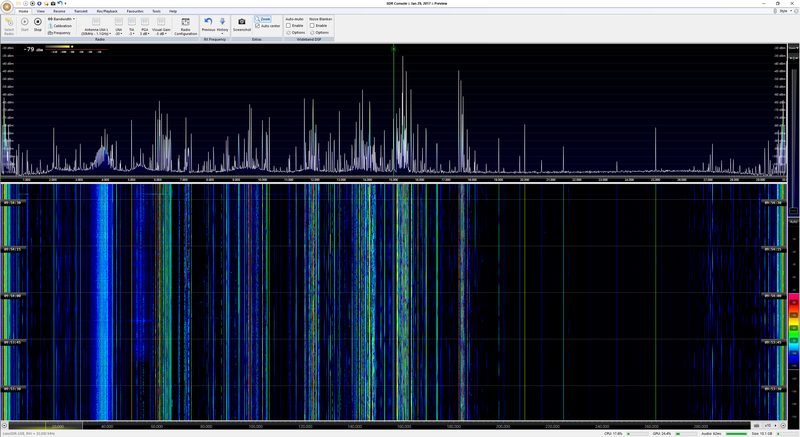 24 broadcast channels demodulated in parallel on shortwave – and Airspy plus SpyVerter do need just a quarter of PC’s power! Always being interested in SDRs with remarkable HF performance, Airspy and the matching up-converter, namely SpyVerter, attracted me. It is a 10-bit SDR, covering 24 MHz to 1.800 MHz (just Airspy) plus 1 kHz to 60 MHz by help of SpyVerter (+120 MHz). Both come in solid metal cases. I did test this combo in detail on HF, i.e. under 30 MHz. It proofs to be a sensitive setup with a surprisingly dynamic range, ending up in clear recpetion of up to a nearly 10 MHz wide band. This may be recorded and eventually played “as live”. The test has been published on 19 pages plus 25 instructive illustrations, and the PDF can be dowloaded here. It is a real hands-on test in real practice. This includes also weak signal reception of data, demodulating and decoding of 24 HFDL airband channels in parallel, DRM and FAX decoding (KVM70/Honolulu) and reception of Auckland VOLMET von 6.679 kHz via long path. The result ist simply stunning: if you are in search for a “low cost, high perfomance SDR”, that’s exactly is it. Yes – Youssef and his team advertise it with this claim, but it is one of the rare cases where such a claim meets reality. Be surprised, become convinced! French version: Bernard Malet was so kind to translate the paper into French, merci! Téléchargez ici, s’il vous plait. One hour in the 20 m ham radio band with LimeSDR and SpyVerter, zoomed out of a one hour’s recording of 30 MHz width. Antenna: quadloop of 20 m circumference. Installing is easy (W10), if you follow the instructions. Without modification, LimeSDR is simply useless on HF. It’s deaf near to a dummy load. The producer recommends a “modification” by just removing one SMD. Then some life came into this range. But it was hard to sort the ghost stations from the real ones. Even a low-pass filter from Heros didn’t helped that much. Just before selling the board on ebay, I connected the antenna first with Spyverter – a state-of-the-art up-converter with an IIP3 of +35 dBm, transferring the band of 0 – 30 MHz to 120 – 150 MHz. This is a range, where LimeSDR sees some light. So, if you are disappointed by the near-non HF performance of naked LimeSDR: an able up-converter will change the game. Recording and sonagrams had been made with SDR-Radio.com V3. 30 MHz live with LimeSDR and SpyVerter shows that it generally works. Same antenna as above. “Ghost signals” make it sometimes difficult to distinguish them from real signals. This sonagram has been made with SpyVerter. Broadcast stations are easy to find out (in their majority). But it gets difficult to sort the ghost stations from the few real ones in the left part. The software’s unique feature is 3D raytracing, showing an anatomy of propagation (see text). HF propagation software seems to be full of mysteries. But its all about modeling physics. There are several models around, the most prominent surely is VOACAP, followed by ASAPS. VOACAP comes in very many different tastes like e.g. PropMan 2000 or ACE. It often has been coined to be the “Gold Standard” among hams and professionals as well. VOACAP gives reliable results on a statistical base for a month, whereas ASAPS returns propagation based on the current conditions of a day. It also gives propagation for an aircraft en route during its flight and takes at least a bit care of multi-path propagation which may degrade digital modes. Both work offline as online, and they are fast. PropLab is giving you a much smarter view on what is really happening on a specific day and time at a specific path or area. It relies on the International Reference Ionosphere (IRI 2007) and uses the ray tracing technique. In short, PropLab is automatically fetching all relevant space weather data (not just sunspots) from scientific sources of the internet to model the ionosphere with its different “layers”. You then give in your path, antenna etc. in a well-supported way. After having started “ray tracing”, PropLab lets refract rays at exactly this ionosphere with its high granularity and some real-world effect like tilts of layers which will result in e.g. propagation off the great circle. It will also beautifully show effects like focusing and gray line propagation, including Pedersen’s long ranging ray with time resolution up to one second – rather than one hour as that of VOACAP.